Today, there’s a digital tool for almost every aspect of financial management, from automated savings and investment to expense tracking to person-to-person payments. Compared with traditional brick-and-mortar financial services, digital financial services can offer greater accessibility and convenience at lower prices. Features such as real-time notifications and automated transfers can help people avoid fees and stay on track with critical goals such as paying down debt and saving for the future. The combination of convenience, affordability, and functionality that digital financial services offer can support greater financial health. The number of people using digital financial services is growing, but take-up is far from universal across different kinds of services and income levels. 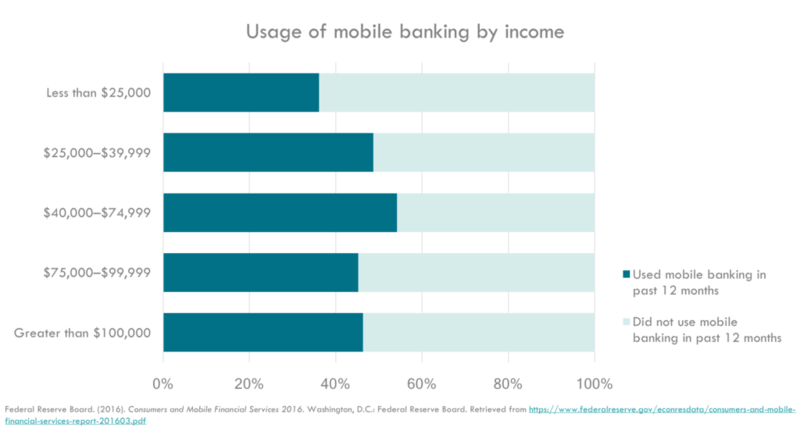 For example, while over 70% of banking customers in the United States use online banking, only 38% use mobile banking apps. In addition, some mobile payments, like bill pay, are popular, but nearly half of respondents to a 2016 Pew survey had never heard of using mobile phones to send or receive money to other people. At lower levels of income, the use of mobile phones and smartphones generally decreases, reducing access to digital products. This gap in engagement can lead to missed opportunities for building financial health – especially for low- and middle-income consumers and those whose needs may not be fully met by traditional financial products. Regardless of the benefits of digital services, there are many subtle obstacles to transitioning financial lives into the digital world. For instance, it can be difficult to keep digital financial tools top-of-mind because there aren’t many physical cues for using them. People may lack confidence in a completely virtual financial transaction with no tangible paper trail, and new providers may struggle to build trust without that human interaction. The seemingly unlimited set of complex options in an app store can be intimidating to navigate with little or no support. Finally, the hassle of setting up financial profiles, managing user names and passwords, and linking external accounts can derail onboarding and cause people to give up. But understanding these behavioral obstacles and clients’ needs can pave the way toward designing solutions that overcome them. This playbook is a guide for financial service providers to use behavioral design to increase engagement with digital tools. All of the strategies are rooted in behavioral science—the study of how people act and make decisions in the real world. It outlines design principles for common barriers to adoption that take into account how people process information, make decisions, and take action. By incorporating this behavioral perspective, providers of digital financial services can build (or improve) products and services that reach more consumers and help them achieve financial health. This playbook outlines a behavioral approach to the design and delivery of digital financial services. In each section, you will find a description of behavioral challenges to adoption and evidence-based design principles to overcome them. The playbook was generously supported by JPMorgan Chase & Co.
Financial tasks usually capture our attention when there is an immediate, short-term need such as paying a bill that has come due. If we have established routines for managing our finances, it’s especially easy for us to continue down those paths without much thought. In fact, most of us are not making a deliberate choice not to use digital financial services – those opportunities for usage simply never make it into our line of sight. The attention challenge is even more pronounced in a digital environment where physical cues and human interaction are limited, and an increasing number of digital products and services compete for visibility. Finding specific moments that align with a real-world need can help bring digital financial tools to the forefront of our attention and increase engagement. We have limited capacity for attending to the world around us, and digital financial services may never even enter that line of sight. Reminders and alerts may pop up for a moment, but may not arrive at the right time, with a compelling message, or with a natural action step – and ultimately may be forgotten. Even if a new product does capture attention, we tend to overestimate the costs of switching to something new and choose instead to stick with products and services we already use. When people come across digital financial services, it can feel risky to trust a new provider or a virtual process with no human touch points and no tangible paper trail. The stakes are especially high when cash flows are tight. Any delays or errors in processing can result in fees and penalties that may affect long-term economic security. Each individual touch point, whether it is a website visit, a log-in, or an email, represents an opportunity either to reinforce or break feelings of trust and confidence. People often look to others to inform their behavior, but in a virtual environment, it’s harder to know what products and services peer groups are using. While many digital financial services provide increased clarity and control for their users, online processes may feel more opaque than services delivered in person at a brick-and-mortar financial institution. People are concerned about the security and privacy of their data, but may not know exactly what to look for to ensure security. A product’s look and feel sends subtle signals about who should use it, which may not resonate with a consumer’s identity. Financial services can be hard to understand when they are unfamiliar or novel. When we come across information that is difficult to process, we may give up and turn our attention elsewhere. And processing new or complex information uses up cognitive resources, leaving less mental bandwidth for decision-making. Making it easier to scan and interpret information frees up resources for decision-making and action. When it comes time for the consumer to make a choice, it’s important to structure the decision so that options are not overwhelming and are clearly comparable. People often scan information quickly and may have a hard time understanding what new products offer and how to use them. Technical or legal language can easily deter people from learning more. While people like having many options to choose from, they actually struggle to choose when faced with a multitude of options or (complex options) that are difficult to compare. Even if we intend to take up and use digital financial services, we sometimes fail to follow through. When signing up for a new product, we might drop off within the onboarding process if it includes complex steps or takes more time than expected. Even small hassles such filling out a form or authenticating a separate account can derail progress. Ultimately, we may put the action off for another day, or even change our minds entirely. People may be interested in new products, but even small hurdles can cause them to procrastinate or change their minds. Automation can ease hassles for some situations, but sometimes can create new hassles for consumers, especially when cash flows are tight. Uncertainty in the process and perceived lack of progress can be demotivating and encourage drop-off. To optimize an existing product or service, see the full checklist on B-Hub or download as a PDF. To identify the challenges your users struggle with most, you’ll need a deep understanding of the situations and external constraints they typically face. A mix of qualitative and quantitative research methods can help you gain insight and test your assumptions about your users. One-on-one user interviews are a good starting point for deep learning about barriers. You’ll learn most by asking “how” questions, talking through specific past experiences, and asking about the process. Asking “why” questions requires users to understand and explain their own behavior (which we all struggle to do). Direct observation can help you map out the sequence of events, understand how actions are completed, and see how consumers react within an environment. Tools like Fullstory and Swrve can help you identify actual points of drop off and engagement in a digital environment. Surveys and questionnaires can help you gather data when administrative data isn’t sufficient to paint a full picture. Putting yourself in the user’s shoes and trying out elements of a product or service on your own can help you get a better sense of where they’re encountering hang-ups. For a detailed guide on conducting in-depth interviews and observations, see Qualitative Research Methods: A Data Collector’s Field Guide from FHI 360. For an overview of how to approach questionnaires, see Survey Fundamentals: A Guide to Designing and Implementing Surveys from the University of Wisconsin. For a sample of validated questions, see this Tip Sheet on Question Wording from the Harvard University Program on Survey Research. To learn more about the limitations of these techniques, see Do people mean what they say? from behavioral economists Marianne Bertrand and Sendhil Mullainathan. For an organized opportunity to experience firsthand the challenges and opportunities in accessing financial services, see FinX from the Center for Financial Services Innovation (CFSI). Administrative data from existing systems are often underused but can offer quick insights and help you identify patterns of use and critical drop-off points. Randomized Controlled Trials (RCTs) are simple experiments that can accurately measure the impact of products and services. A/B tests, a type of Randomized Controlled Trial, measure and compare the effectiveness of different versions of a program feature, service, or communication. For a comprehensive guide to running Randomized Controlled Trials (RCTs), see Evaluating Financial Products and Services in the US from Innovations for Poverty Action (IPA). For a guide to A/B testing, see the A/B Testing Tool from ideas42. The Behavioral Evidence Hub compiles innovative solutions from behavioral science that have been proven to amplify the impact of programs, products, and services. The U.S. Financial Diaries tracked 235 low- and moderate-income households over the course of a year. The detailed financial data collected through this study sheds light on common issues such as income volatility, financial planning and budgeting, credit challenges, perceptions about financial providers and products, and community dynamics. In Weathering Volatility: Big Data on the Financial Ups and Downs of U.S. Individuals, the JPMorgan Chase Institute analyzes detailed transaction data to determine how income and consumption fluctuate on a monthly and a yearly basis. The Web Content Accessibility Guidelines (WCAG) 2.0 offers recommendations for making Web content more accessible to a wider range of people with disabilities such as blindness and low vision, deafness and hearing loss, learning disabilities, cognitive limitations, limited movement, speech disabilities, and photosensitivity. For a practical guide to testing native apps and the web for accessibility on Android and iOS, see The TPG Mobile Accessibility Testing for Android and iOS from The Paciello Group. Other resources from TPG include a primer on accessibility and a set of inclusive design principles. Programs and activities funded by federal agencies are required to adhere to guidelines in Section 508 of the Rehabilitation Act of 1973. Digitalgov provides an overview of requirements, along with resources for developing content and testing content. For example, many people will never bother to change a default setting such as automatic subscription renewals, even if they don’t want the subscription to renew. If your users were prompted to make an active choice, would they still be happy with the option you set as the default? Would they see you as a provider who’s on their side? In an age when users can abandon your service or switch to another provider with one touch or swipe, a genuine dedication to the financial health of your users will differentiate your company and support long-term sustainability. ideas42 would like to thank JPMorgan Chase & Co. for their generous support of this project. We are also grateful for the time and support of the many organizations that shared their insights or served as examples in this playbook: Alliant Credit Union, Aspiration, Bank of America, BFA (Bankable Frontier Associates), Catalyst Miami, Center for Financial Services Innovation, Digit, EARN, EverSafe, Flourish Savings, FS Card Inc., JPMorgan Chase & Co., Kinecta Credit Union, Latino Community Credit Union, LendingClub, National Urban League, Neighborhood Trust Financial Partners, Policygenius, Propel, Prosperity Now, Texas Tech University, UNC Center for Community Capital, and UnidosUS. The views and opinions expressed in the report are those of the authors and do not necessarily reflect the views and opinions of JPMorgan Chase & Co. or its affiliates.